Clint Savage, a native of Sacramento, California, loves the Theatre Pipe Organ. He is a member of several Yahoo! news groups dedicated to the King of Instruments. 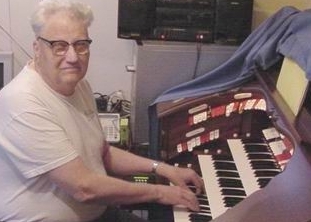 He owns two organs, an authentic Morton Theatre Pipe Organ (which he has for sale), and an Allen George Wright Signiture Series GW-319 Digital Theatre Organ. He has contributed a nice Windows desktop wallpaper to the Free Windows Desktop Goodies page in Walnut Hill's General Store. He is an ace when it comes to editing MIDI files. I started on the piano at around age 6. I had a teacher for around one and a half years, and then I could not see the music on the stand anymore. I tinkered with the piano for years, getting funny shaped ears! Sometime in the 60's, a cataract removal surgery was performed and I was better able to see. One day my Wife and I drove down into the Sacramento River Delta. We stopped at the "River Mansion", a large four story home on a slue! In the "ballroom" was a CONN 645 Electronic Theatre Organ that I purchased. There was also a Morton Theatre Pipe Organ there, from the Capitol Theater, which I left in place. It had been a single bolster 3/11 or something like that, but someone had added a double bolster for some reason. Half of the stops did not work, but it looked nice. By this time, I had learned of ATOS, so I did "try" and play it. Later, I joined the Sierra Chapter. Well, in the 70's I saw a add for the St. Francis Theater's Robert Morton, a 3/15 -1 (the midnight organ supply had hit the chambers, you know, GW.) No toy counter, harp, xylophone or Kinura rank, or the top 1/3 or the Tibias. These had ended up in the Fox Theater in San Francisco. This was the same town as the St. Francis. I forget what organ they landed in. Yea, there was a lobby organ. Well, I started learning. A third of the roof came off the garage at my home (4 door), and up it went with a cupola for the 16' pipes from the North Shore organ in Chicago. I came by a 10 HP 3 phase blower and a piano, and some wood! Along the line, I got a Yamaha DX7-IIFD synthesizer and learned about MIDI. Five years ago, the Conn 645 went to the Salvation Army. I then came by a Conn 653. Oh, God. That was an error. The CMOS chips inside were very finicky. Shut the lid and something goes away. Then the local Allen dealer did a demo of an Allen R-311 side by side with the Sierra Chapter's 3/13 Mighty WurliTzer! Same volume! Not quite the same sounding ranks. But still, I was hooked! So MIDI, Allen and I came together, and now I own an Allen George Wright Signature Series GW-319 Digital Theatre Organ. Then one day, while surfing the internet, I came across a Yahoo! user group known as Theater-SF! Well now, that was interesting. A group dedicated to a virtual theatre pipe organ known as the MidiTzer by Jim Henry. Maybe I could edit in more comfort from the bench of my organ rather than sitting on the drummer's thrown by the Allen if I could get it and my computer connected using the MidiTzer? I still have not learned how to feed a MIDI file to MidiTzer but, oh well! 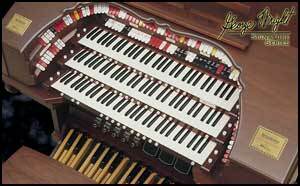 As a member of the Allen Organ Owners list on Yahoo!, I started begging for MIDI files and learned they can teach! Yea, not like a live body. Then, I found Walnut Hill, and Owen Jones, one of Walnut Hill's Featured Artists, put an MP3 on a page at the site. (Well, The Bone Doctor did.) a crazy little diddy called The Waltzing Cat! Owen sent me his file (thank you again) and I converted it to play on the Allen GW-319, less the barking dog! Studying MIDI files and listening to the advice and performances of other players have helped me to do some better playing on the keyboards. I have "pushed" some suggestions Jim Henry's way, and time and his ambition will see the results. I can tell you all righty now that three manuals are a boon! I am not knocking two manual organs, They are great, but that extra one makes life so much easier, er... playing so much more fun! I still can't see well enough to read music, as my eyes have to be within two inches of the page or screen. The misshapen ears do a lot of the work. Then there's the storage media that dumps odd bits and pieces to the fingers, and the foot that needs an eye! I am not good with the Swell Shoe. The only time I push it to the metal is when the Wife goes out or to the doctor, or I have on earphones! Comments about the above song go here. MIDI is a way to program music and have it play through your computer using you sound card and the SoundFonts that come with the card. Some motherboards have an onboard Sound function or Codec installed. I use a Creative Labs SoundBlaster Live! PCI card. There are three standard SoundFonts for this card that are 2, 4, and 8 megabytes in size. Folks with good hearing may be able to hear the difference, but I cannot. I use the 8 megabyte size Font loaded in Bank 0, as I have plenty of memory allocated for it and some other Fonts in other banks. In Bank 25, the VTPO SoundFonts for MidiTzer by Bruce Miles is loaded, so that around 10+ megabytes of allocated memory are used for all Fonts. I use one of two Cakewalk programs on my machine to record MIDI: either Pro Audio 9, or Sonar 3. I have also "grabbed" other software programs to test, but I find Cakewalk Pro Audio 9 to be the best for me. There are times that a function in Cakewalk Pro Audio 9 stops working, and that's when I go to Sonar 3. The first screen in Cakewalk Pro Audio 9 has a lot of icons at the top. That whole mess is editable! It can be changed by adding or removing work icons from the toolbar. As I have to work in 640 x 480 screen resolution, to see the files, I have cut back on the number of icons on the toolbar. Below on the left are the channel data lines. They allow Name, Mute Solo and Record clicking, and changing the Key of the channel, setting the source for recording, the patch name (i.e. Tuba, Piano, etc.) and so on! To the right is a display of the recorded channel data. I have learned to tell the amount of swell pedal used (Control 7, normally) when notes are played on the channel and sometimes when a patch (or in my case NRPN stop calls and cancels) by just looking. Events: tha real data that plays. Also, time in hours, minutes, seconds and ticks, or in the format 1:01:000 (that is measure, beat and tick in that beat! (That is for programming, really. I can't play in that type of strict time! Grin. Then there is the Channel number, Note value C, or C#, the Velocity the note was struck and how long. Each line can also show the Patch number, Control data, Pitch bend, NRPN number, SYSX data, Text or Lyric data and a gob more, including AUDIO! Yea, you can record audio in Cakewalk Pro Audio 9 and other programs. I have not tried this in Cakewalk Pro Audio 9 yet, but I think you can play a MIDI file AND record the audio at the same time? Score: Will show a scoring of a channel. Tempo: Shows the tempo "line" that can be changed. I see there are 14 different views. You have to have the additional cards for 3 of them! Oh yes, did I mention Video???? Confused? Don't feel bad. MIDI editing for OUR needs can be easy, as really, there are not that many things we want to do, such as change patches, delete a note struck in error, or move it up or down, and so on! It be fun!